Enterprise was able to rent us a car. 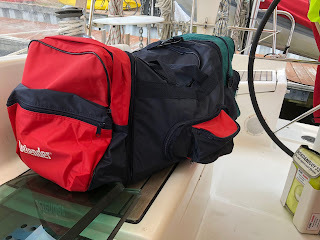 We would just have to return it on Saturday, leave the keys in their drop box, and walk back to the dock, about 1.5 miles-doable. They came right away. First stop, James Distributors. I didn’t go in with Dave, so this is his replay of what happened. The pump that was in stock was at their warehouse (across town) and they wouldn’t have it in the store until Monday. Well, you can imagine how that went over with Dave. When he explained that their site said it was in stock and ready for pick up, we rented a car for the day to get the pump. She sweetly said “that’s unfortunate”. She also told him he could look on the shelf for one. He laughed at that. Her computer said they didn’t have one. Besides, most people would look for you, not send you to look. After giving them a piece of his mind about how to run a business, he left a little upset. I was parked around the side of the building, so I didn’t see him stomping his feet and swearing when he stepped out the door. Before we even left the parking lot, he started searching for another one. 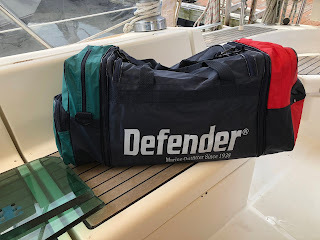 He called West Marine. The closest one they had was in Annapolis, HAHA. Dave then checked online with Defender. They had nine in stock. They are located in Waterford, Connecticut about 90 miles away. We called them to make sure they had them and took off in our rental car for CT. We checked on the Mercury part and it didn’t come in, so we skipped that stop. We drove to Defender 4 years ago and picked up a barrel of chain. It’s crazy that we’re here again. This is the second pump we needed in 4 years, so we decided to buy 2 pumps. We walked through the place to see if we came up with anything else. I bought 2 bowls to match some that we have. Ellen was checking us out. Dave recognized that he had talked to her on the phone several times when ordering from them. He complimented her on how she handles business. When she gave me the bowls in an orange bag, Dave joked about how pretty it was and I could walk around the mall showing it off. She grabbed a soft sided carry on bag and said “here’s a better one” and held her finger to her lips, meaning don’t say anything, just go. It was a really cool bag. Its “medium water proof”. The material feels water resistant. But there’s lots of zippers. It can actually be 4 bags. The two ends zip off and one had back pack straps. The front pocket zips off and has fanny pack straps. Now that’s how you do business. I was in this area many years ago visiting a friend. I remembered that we bought lobsters to take home and cook ourselves. But there was a restaurant there, too. 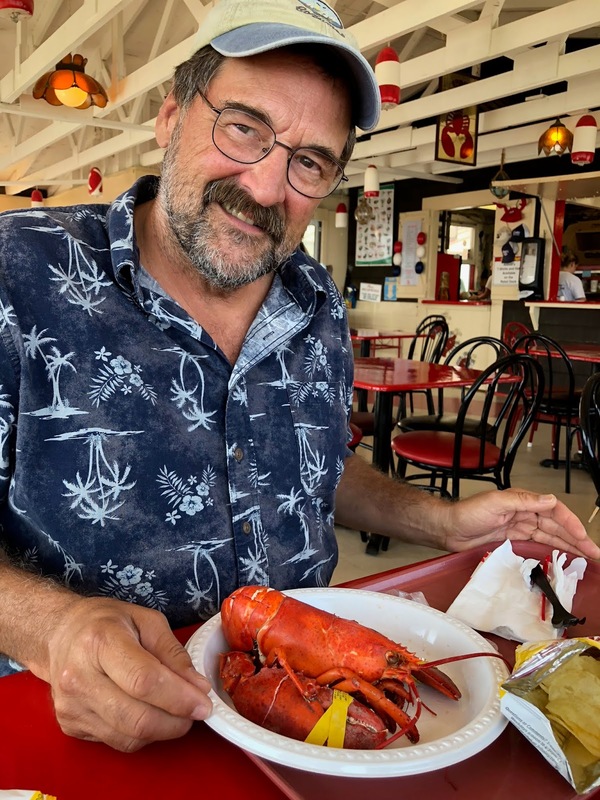 We found Abbot’s lobster house and treated ourselves. 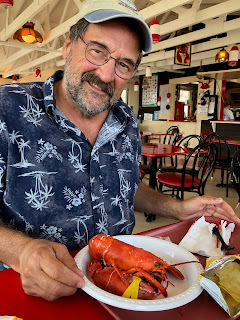 Dave got the 1.25 lb lobster and I got the lobster roll. Most places make a lobster salad roll, but this was all lobster meat. Yummy. If we didn’t stop to fill up with gas, we would make it back to Enterprise by 5:00. So we opted to pay their gas price and get a ride back to the dock. Yay, I don’t have to set an alarm for the morning! Dave installed the new pump tonight and we made water with no leaks! !